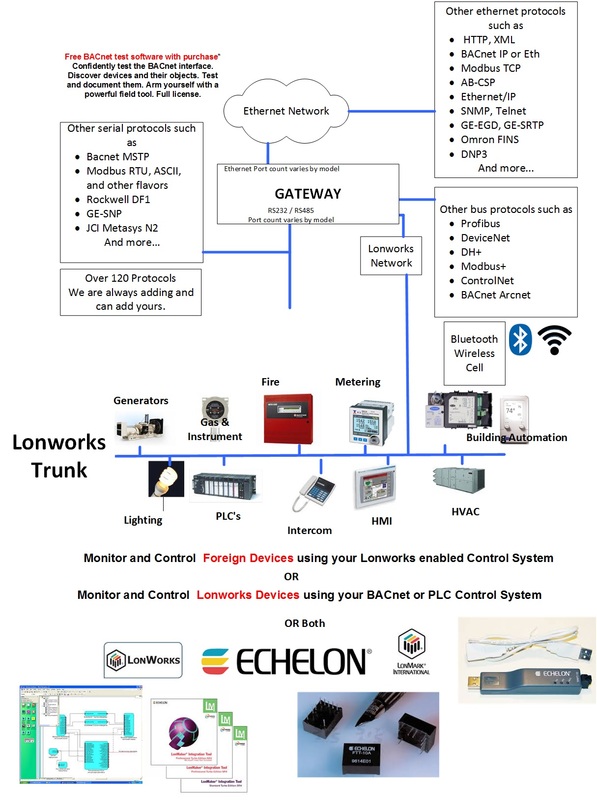 A FieldServer protocol Gateway that provides data exchange between LonWorks and Modbus RTU. Modbus Serial over RS232 or RS485. We have all variants of this protocol. The Modbus RTU driver allows our FieldServer gateways to transfer data to and from devices over either RS-232 or RS-485 using Modbus RTU protocol. The Gateways are capable of being used as port expanders and can emulate either a Server or Client. The FieldServer is capable of supporting devices that use two Modbus Registers to transfer IEEE floating point format. The information that follows describes how to expand upon the factory defaults provided in theconfiguration files included with the FieldServer. 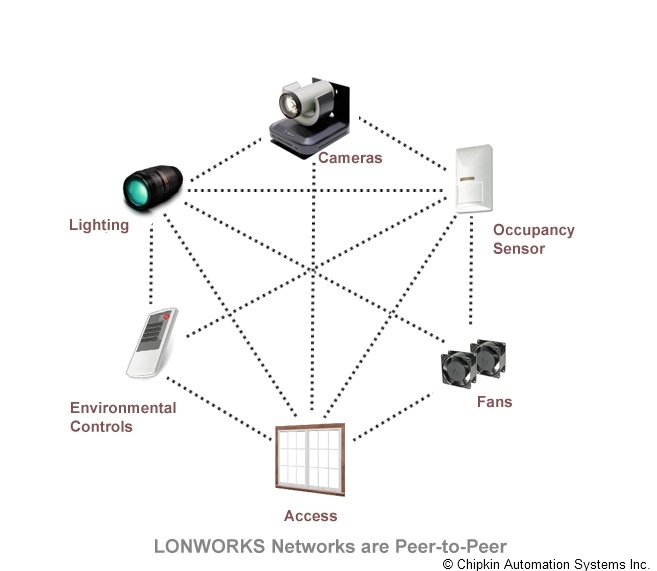 There are various register mapping models being followed by various vendors. Modicon_5digit – Use this format where addresses are defined in 0xxxx, 1xxxx, 3xxxx or 4xxxxformat. A maximum of 9999 registers can be mapped of each type. This is FieldServer driver’sdefault format. PDU –Protocol Data unit address. Use this format where addresses of each type are defined inthe range 0-65535. The key difference between ADU and PDU is for example if Address_Type is ADU and address is 1, thedriver will poll for register 0. If Address_Type is PDU, the driver will poll for address 1. 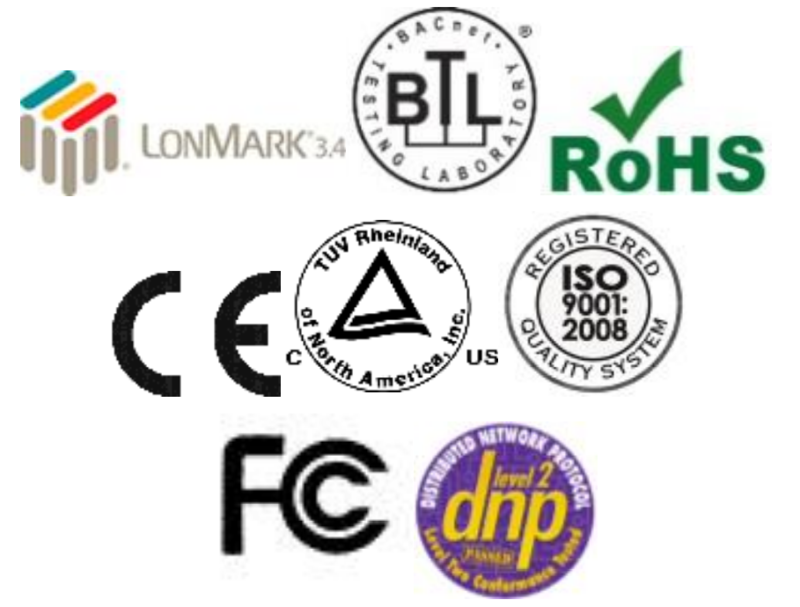 If you are reading the documentation for sensor blocks, valves, and other devices, you must keep in mind that some vendors may document their hardware in different ways. According to the Modbus standard, addresses are simply integers from 0 to 65,535 with the different address ranges being referred to as coils, holding registers, etc. However, some vendors will document their hardware using numerical prefixes which are not actually part of the Modbus address. This originated from some models of PLCs which used the Modbus communications protocol, and which also used numerical prefixes in their internal data table. This is similar to using “I”, “Q”, “V”, etc. as address prefixes in IEC type PLCs. However, it is important to remember that these numerical prefixes are documentation methods and are not part of what the Modbus protocol itself sends as part of the messages. A difference in documentation methods does not affect the compatibility of the protocol itself. Note that there is no 2xxxx address prefix. In addition to numerical prefixes, some documentation will refer to protocol addresses (addresses start at 0), while other documentation will refer to data model addresses (addresses start at 1). That is, the first holding register may be 0 or 1 (or 40000 versus 40001 using prefixes). However, this has no bearing on what gets sent over the wire as a Modbus message. For a Modbus protocol message, the lowest address is always “0”, not “1”. Modbus does not provide a method for transporting large or Floating Point numbers or a mechanism for scaling analog values. A 16 bit word can only contain values in the range 0-65535. Only whole numbers are permitted. To work around this many server device manufacturers use multipliers and document them in their manuals. For example, to report a temperature of 58.5 the device reports a value of 585, and makes a note in the manual that the master should scale by 10. This scaling is achieved by adopting a convention between the client and the server. Modbus does not provide a mechanism but 3 important schemes are widely used. Long Integers – Two consecutive 16 bit words are interpreted as a 32 bit long integer. MK10 values – Two consecutive words are used. The 1st reports the number of units and the 2nd reports the number of 10,000’s. Floating Point Numbers – Two consecutive words are used and a scheme. These schemes are conventions and not all servers or clients support them. The protocol does not identify these big numbers. Only the vendor docs do. What we mean by this is – if you look at the byte stream in a Modbus message there is no way of telling whether you are looking at two consecutive 16 bit words, or two consecutive words that should be interpreted as floating point, long or MK10 formats. Because of this you always have to look to the vendor docs. Download our Modbus for Field Technician for free, or purchase this guide for $20 on amazon.com. FieldServer can easily be configured to allows a Modbus RTU client to talk to a ModbusTCP server and vice versa. You do not need to tell the FIeldServer which registers to map from one to the other. You simply configure the FieldServer telling it which port and protocol to use for each node. In port expansion mode configuration can be moinimal. Tell the gateway which nodes are on which port and set the port settings. FieldServers can scale data and manipulate values using some binary logic and arithmetic functions. Scaling can be applied to each block of Modbus Data read / served. Move to change type : Convert from any FIeldServer Data Type to any other. Move to pack/unpack bits and bytes: It’s possible to address each bit in a 8,16 or 32 bit data element by using the packed data types. Move to change byte/word order: Handle the endianess of the remote system easily. Most functions can be configured to occur on a configurable period or on update of the data source. Similar to ModbusRTU but for each byte in an RTU message, there are 2 bytes in an ASCII message. The 2 bytes are the humand readable form of the single hex byte. Encapsulates RTU messages and adds a header. Many slaves ignore the NodeID field in the message. 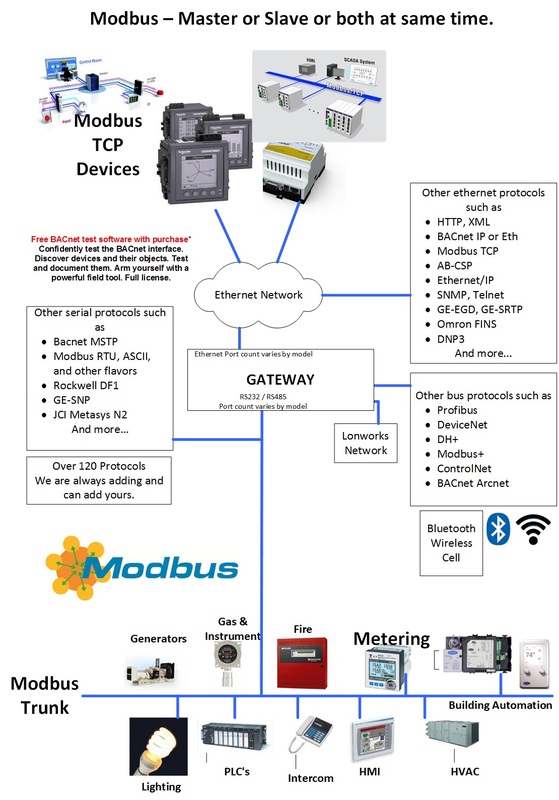 What are the different forms of Modbus?